Planting a dormant seed... and watching and waiting for it to burst out of the soil is a powerful experience. My seedlings down in the basement quickly became 'our babies' and our attention to them was rewarded by little peeks of green pushing up and out of the seed start pots. We had a blast noticing the plants from the same families as they grew: the cucumbers & squash looked the same, the cabbage, kale & broccoli looked the same - the onions looked different than the rest. Regardless, whenever something new popped up - we did an excited dance. The first year - (like I'd mentioned in Part One) - I was over eager and planted my summer vegetables WAY too early... including things like pole beans - (which you really shouldn't start inside at all)! I was just so excited and wanted to get a head start on everything. Since we only had a couple of grow lights, I soon ran out of space for my starts, so I moved them to other places around the house. I also planted in anything I could find! Pots and containers of all shapes and sizes... There was SO much experimenting! I am grateful for the risks I took and that I tried whatever I could. In hindsight I've learned so much by that trial and error. As I look at the above picture - I recall several things. 1. It is very silly to try and start pole beans indoors. Those beans on the end of the bench grew and grabbed onto eachother so much - that when May came around, they were too tangled to separate! The seeds I planted straight into the ground quickly passed them up. Better to plant out beans directly into the ground, like the seed packet says! 2. Though I love the look of terra cotta pots... I now only really use them for a potted herb that I plan to keep in that pot. When the time comes to transplant a plant into the ground, they are very hard to get out. The pots are porous, and the roots kind of attach to the inside, making it hard and stressful on the plant as you try and remove it. Better to save old plastic pots (I ask friends for them - and save any that I have from buying potted flowers, etc.) They are the best to slide transplants out of. 3. I thought it was so fun to plant in that old metal stock pot....but what a mistake to plant so many starts inside of one container! The roots entagle and become impossible to separate without hurting the individual plants. Better to plant one or two individual plants per pot. I have always been generous with my seed sowing. I would rather have too many plants, than not enough - and sometimes you'll get a few seeds that don't germinate. It's fun for me to share potted veggies with friends when I have too many. 4. I started SO many squash plants that when it was time to set them out in the garden, I couldn't fit them all according to the proper spacing. I'm kind of a 'more is always better' type of person - so I just planted them all - I put about 40 squash plants into one row! I was thrilled that they all took off - but when mid-summer came - my squash forest was so dense that it was nearly impossible to find the zucchini that was hidden. Also, by the end of summer - they got hit hard with powdery mildew from the lack of air circulation. Better to space your squash out a bit (though I still always plant a bit closer than recommended - (can't help it... I want to grow a lot of food in a small space!). In Colorado, powdery mildew is almost a guarantee by late summer - but I might experiment with using baking soda early on my soil to try and prevent it. One of the worst mistakes I made that first year, was planting a bunch of squash plants out into the garden in early May. We had been having warm weather - the plants were getting too big for the pots, and although our safe planting date here in Colorado is usually after Mother's Day - I went ahead and set them into their beds in the garden. What I didn't know was... these warm-loving plants had been raised indoors - and were used to the constant temperatures of our home - (never dipping lower than 65 at night). Late Spring in Colorado's evening lows fall much lower - and the plants did not survive. We had a frost a day later - and I lost 80% of all of the starts I had planted. I will admit I cried like a baby to lose all of those plants! My girls just stared at me as I sobbed and got out my seed packets to start over! My neighbor (an experienced gardener) looked on from her yard as I eagerly had planted too soon... and said she knew I must have been heartbroken after that frost. I had lost 2 months of time on those plants. In the end, it turned out to be fine. I still had plenty of time to get some squash going again - and my harvest was plentiful that year. I've learned that a plant started indoors must be hardened off before moving outdoors. This involves taking the plants outside and letting them get used to the cooler temps a little at a time, then bringing them back indoors. I watch how they respond each day - (sometimes they wilt a bit from the shock if it's much cooler) but mine usually do fine after 3-4 days. Despite all of these mistakes - we still had a lot of successes. Because I started so many other plants - we still had plenty to set out, come Mother's Day. 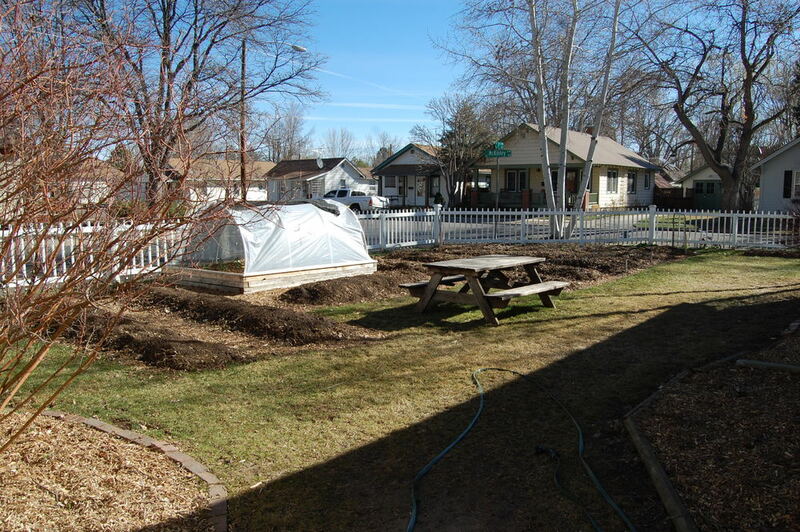 When we dug up our side yard in 2011 - we moved these smaller raised beds to the south side of our house. I had been inspired by Eric Rochow's podcast & videos and learned how to build a cold frame using recycled windows. This is a way to extend the growing season, since the temperature of these beds will be much warmer (being above ground, and warmed by the glass). We've had success each year with these frames - as long as I remember to lift the glass and vent them on warm days. The temperature can really cook if left closed in direct sun. I've kept salad & spinach alive all winter under glass - though the plants slow way down mid-winter. They are most useful in early spring - getting lettuces started at least a month sooner - and keeping things alive in late fall. I would recommend trying this anywhere - to get a jump on things! Though the picture below is a funny one of my three oldest, the row cover behind them is another experiment we tried. It was a frame that my husband built to cover the lettuce bed and allow the seeds to start a bit sooner than usual. A row cover like this can be placed over a bed in early spring to warm the soil and prepare it for planting. The plastic can come off when we are done with it, the pipe lifted and stored. This year for 2013, we hope to use this method to cover all of the above beds by late fall - to extend our garden into the winter! A simple barrier of plastic can increase the growing temperature by 20 degrees! Eliot Coleman's Four Seasons Farm is an inspiration to me, as he grows year-round in Maine's harsh climate. If he can keep things alive all winter for his farmer's market - surely we can too! The most exciting addition to our yard & garden in 2011 - 2012 was our permanent greenhouse. We were blessed to find a wonderful stash of old windows that our neighbor had been collecting. He wasn't using them, so traded them to us for some specialty wood that Jeremiah had saved. His generous trade helped us to dream up our greenhouse, as we built it around the windows. We found the door, and a few extra old windows to add at our local recycled building supply store. It was a fun process to lay out the windows we had on the ground, measure, re-arrange, and figure out which ones to use on which side. It was even MORE fun to see the walls going up! Progress by end of 2011 - with hole in the roof from a heavy snow that sent a branch through. The combination of cold frames, hoop house (row covers) and the greenhouse are a wonderfully helpful way to get an early start on planting - help to transfer indoor seed starts to the garden (thus saving money by purchasing seeds instead of plants). It's a wonderful beginning to do whatever you can - with whatever supplies or resources you have. Take it one step at a time! When my hubby and I purchased our home 10 years ago, we did not realize then - what our 1/5 of an acre lot could become. We were just thrilled to have purchased a spot where our girls would be able to play and run. We could not foresee rising green bean trellises, spreading squash forests, ducks waddling, litters of baby bunnies in the spring, or a greenhouse brimming with veg. This adventure in growing our own food grew up organically, you could say. Our own family health issues led us on the journey of discovering how intricately FOOD is linked with GOOD HEALTH. Once this had permeated our thinking, organic produce became a priority. We'd grown small gardens with a few tomatoes and beans here and there each year (which was a wonderful beginning) but it never amounted to enough to make a difference in our grocery budget. And a difference is exactly what we needed. My husband began a new way of eating (no carb, no sugar) for the management of his own health - and I realized we just couldn't afford to purchase such large quantities of fresh, organic veggies. We had to figure out another way. This is where my over-confident optimism kicked in (a character trait of mine that I'm not sure whether I love or hate). "We should just try and grow our own produce! I am sure if I research enough - I can figure it out!" I determined to read every page until I understood how to grow food well. I did read every page.... and I did learn a lot. In reality - it was a wonderful place to start - but I would learn MUCH more from the experience of trying, failing, succeeding, being inspired by other gardeners and tasting the wonderful results of our hard work. We spent time sketching out where we wanted the beds... and although it was January (and much of the deep ground was frozen, we rented a sod cutter and started in on removing the lawn!) It's amazing that we didn't break the machine... (I'm a little impatient, I'm sure it was my idea NOT to wait until Spring). It did work! We got most of the sod out. (I did not like the fact that my hubby used spray paint on my soon-to-be organic veggie bed - but some things can't be battled over.) I shouldn't complain... he does so much to turn my dreams into realities!! I will admit to some mild panic after we dug these huge patches out of the lawn. I wondered if I'd just totally ruined our beautiful yard (though NOTHING looks very beautiful in the brown mid-winter). We rented a tiller and really turned the sod in and under to break things up after a week or so. I have learned, since - that tilling is not the most beneficial way to improve the soil. Adding compost to the top, and then covering well with mulch will draw up the earthworms and they will do the hard work for you. I think it would have taken much longer, though if we hadn't tilled. We have not tilled since - and the results (with heavy mulching only) have been wonderful. Here is an incredible video about the benefits of mulching instead of tilling (saves water, keeps weeds at bay, enriches soil). Ruth Stout's 'no work garden' has given me inspiration, for the years since. I have learned to mulch, mulch, mulch from this funny lady. I don't leave my garden as 'untidy' as hers... nor do I garden naked... but her methods are amazing! We ordered seeds online from Baker Creek Heirloom Seed Co. and Seed Savers Exchange, and in February we got prepared to plant indoors. There's nothing like potting mix on the kitchen table! Although we did purchase some standard seed starting trays, we also had fun creating pots from toilet paper rolls and newspaper. It was fun for the girls to be a part of the whole process. This year - we made our own seed start mix. I spent a lot last year on pre-made bags of potting mix. 3 parts compost- this is your feeding agent - rich in nutrients. Starting a simple backyard compost pile will keep you supplied with rich, home made compost each spring. 1 part perlite - (the white puffed rock) - this is your air agent - keeps the soil aerated and not compact. 1/2 part greensand - this is a natural mineral agent that slowly releases nutrients and retains water. * note * - I purchased organic compost this year for my seed starts. I hadn't started my worm bin in time - and my outdoor compost pile is still quite frozen. Sometimes you've got to use whatever you can and just get started! Jeremiah installed grow lights in the basement, which has been the perfect place to give our seeds their start. He was given some of these old light fixtures - and fitted them with plant bulbs. In this first year - I started a lot of the wrong things - too soon (beans, squash & tomatoes) - and was just SO eager that I ended up losing most of them because I didn't harden them off before planting them outside. Still... it was SO exciting to see the basement filling up with green, while it was still drab outside. The next step was re-potting a lot of these little starts into larger pots, and then 'hardening them off'(once large enough) to move to the outside greenhouse. Jeremiah started building this for me in 2011, but we finished it in 2012. The first year, I kept my pots all throughout the house (near windows, in our bedroom... everywhere!) until the weather was warm enough to plant out. More details on the making of the greenhouse in The birth of the Sailer Urban Homestead - Part Two ... but here's a sneak peek! It's not too late to get your seeds started for this year's garden... make a plan (start small) and give it a try! The rewards of this rich learning experience are so worth the effort.